There’s London, and then there’s Berlin. It’s the nature of travel that you find your own story wherever you go. You arrive, you breathe, maybe the air smells different. You walk around, eat the food, see the streets, the way the history pours out of the cracks and the way the people walk right over it, like it’s a stage and they’re in the play, right where they’re supposed to be. Your eyes, hopefully, are open, seeing everything for the first time. It doesn’t really matter what you do, this unfamiliar environment is going to be the backdrop through which you are forced to see yourself in a new way, beyond your habits. That’s travel, yes? The wooden track around the booth area. Road bike frame set and stainless steel touring bike. Favorite photos on the table. I went to London to attend the Bespoke Handmade Bicycle Show. Most of the attendee’s booths were in the center of a bank-walled cycle track at the Olympic Velodrome. People rode the track around us throughout the entirety of the show. It’s cool because people use the velodrome kind of the way we use a public pool for swimming laps. You go, take a class to certify that you are aware of the safety issues of track riding, and then you are able to come to the track during open hours and ride until your legs are on fire and your lungs are exploding in your chest. If that’s what you want to do. Waving at the waving cat. Looking for anything that shines. Chris of Igleheart Bikes, and Eric of Winter Bicycles. Oregon builders in England. Andy Newlands of Strawberry Cycles, waiting for the crowds to show up on the first day. Jay at Cielo & the Chris King booth. The show was well attended, for sure. I took a couple of time lapse videos that show the surge of people during the peak times. The show was spread over three days from a Friday. By the afternoon of each day, as my voice started to give out from having spent the day talking over the heightened decibels from the crowd buzz, I could see in people’s eyes a spiraling glaze forming. The number of pretty bikes one person can look at in a day depends upon that person’s constitution. I’d give most averagely bike hungry individuals 2.5 hours of relatively continuous active interest before cogs, stays, tubes, angles, features and head badges begin to vibrate and swirly in an exhausted mesmeric pull toward somnambulism. Why I liked this show: New people, new friends. Bicycle building is really taking off in the UK, and, I think, in Europe in general. People are looking at the U.S., and how the market has grown, and are very excited about this sort of re-birth of the hand made bicycle industry. England has, I think, a lot of similar issues as the U.S. in regards to its society becoming more oriented toward the service industry, and is losing (or has already lost) much of its manufacturing to overseas interests. Consequently, people aren’t being taught to use tools, how to work with their hands. But, as in America, there are a lot of people who find a great deal of satisfaction in taking raw materials and making them into functional, useful things. Now that there has been this sort of re-introduction of bicycle craft, the general hunger for it is there, and it’s taking off fast and furious. 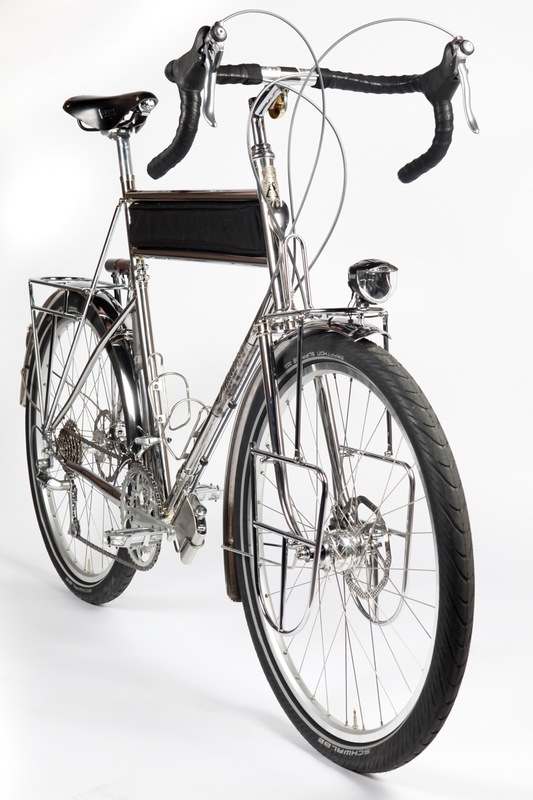 I found it interesting talking with builders from the UK about how, forty or so years ago, people from here in the U.S. who wanted to make custom bicycles had to travel to the UK to find a builder to learn from. But then something happened, and the custom bicycle scene in Britain died nearly completely, or went mostly underground, so that only those who were paying the closest attention even knew what a custom bicycle was. In that time, some of the grumpy old guys here in the states (I say this lovingly) learned and perfected their craft. But it wasn’t until the mid to late nineties, and more-so shortly after the millennium, that the “new breed” of bike builders started to take up the torch, so to speak. This is the generation of builders with whom I’m associated. This was also the beginning of the real splash of popularity in the world of custom bikes. You could point to bike shows and the internet, both working like giant marketing campaigns. And then there was the United Bicycle Institute and a handful of private teachers who showed that you, too, could learn to build your own bicycle. I theorize that at least some of the popular desire to learn to build bicycles was a result and repercussion of the general societal trend toward desk jobs with lots of screen time. Not everyone is satisfied being sedentary and cerebral, and yet, unless you carve your own way and are looking specifically at learning a trade, children and young adults are not getting the opportunity to discover if turning a wrench would even be interesting to them. Somewhere along the way getting your hands dirty lost some of its respectability. People wanted to be managers, and they expected that their children ought to be managers, and so shop classes and home-ec classes (and so on) lost funding and support. But wait, how did we get here? I was talking about a bike show. Ryan from Oak Cycles is one of the UK builders whose business is there in London. His workshop was about a six minute cycle from the velodrome, about the closest of anyone’s to the venue. I think he said he’s been building for about four or five years now, and he makes some very cool bikes. One of his recent projects is a long-john style cargo bike. One thing I noticed in London was that there weren’t too many cargo bikes on the roads. I saw a couple of Bakfeits, and a Christiana box trike, and maybe a Bullit. Ryan said that cargo bikes hadn’t really caught on yet. Momentum was beginning to build, but they were still some years out. As far as the build went, I think Ryan pretty much nailed it. And, when I asked him about it, one of the first things he discussed was the things that he did differently on this bike from the last, and the things he will do differently on the next one. That, in my opinion, is the sign of a good builder — always looking for ways to improve. Especially when building bikes that are somewhere outside of the traditional two-wheels, two-triangles, it’s like a puzzle that can go together in so many different ways, some of which function better than others. The only way to learn is to build it, ride it, revise your ideas and build it again. There’s no such thing as perfection, but you’re always trying to get a little closer to it. Nik's waving, and friend Tim is along for the trip down the canal. Cooking a delicious rice & vegetable curry. Check out the scuba dog. Ryan’s wife, Nik, was at the show as well. She is a mechanic, and works at a bike shop and cafe called Look Mum No Hands on Old Street. Nik’s a fiery Irish woman with long red hair and a broad smile. She’s quick to laugh and loves bikes as much as anyone, probably more than most. She and Ryan make a pretty good team, and are constantly scheming where they’re going to go on their next bike tour. They live on a house boat on the canals of London. I didn’t know this, but there is a whole culture of people living on their boats. Canals run all throughout London, and out into the countryside. You can go just about anywhere. It’s pretty cool because they can move to various parts of the city depending on what’s going on in their lives on any given day. They’ll tie up near Ryan’s shop for a while, and then move closer to Nik’s work, and maybe go a little further out if they’re looking for some peace and quiet. Between the boat and their bicycles, they’ve got a fairly mobile life. The boats that people live on are all of a certain style, long and narrow. It’s a lot like living in a compact mobile home. There’s a kitchen, a bedroom and a shower, and the small living/dining room area of Ryan & Nik’s boat even had a little wood burning stove. Very cozy. Ryan likes to build bikes, but, he says, he hates being a salesman for his products. He doesn’t really like to call his bikes “products.” They’re not products, he thinks, they’re bikes. There’s some personal attachment there, which is understandable. Translating this attachment into business-speak (products!) takes some internal reevaluation. I wonder how many bikes one has to build and sell before the semantic transformation happens. That’s what it is, really: Semantics. I wonder how long one has to live on a barely living budget before one’s moral perceptions or personal ethics (again, semantics) evolves into something different? What we’re doing, in the end, is making a product and selling that product so that we can live. It’s hard, though, when the product we’re making is conceived of and built out of love, a desire to create, the hope to make the world a bit better place in which to live. How not to be attached to this? How does the writer write the story and put it out in the world and not feel some sense of attachment to it? There are many parallels to having a child, each bike a baby, each painting, each song from the musician. As the parent, you want the best for it, but in the end, when a bike or book goes out into the world, the one who created it has to let it go. And, in strict marketplace terms, we’re doing a job in hopes of getting paid. Thus, at the end of the day, whatever you’re making, no matter how much love and creativity are involved, if you’re making it for money, it’s a product. Sell it and watch it go out the door. Or maybe all these words are clear evidence that I’ve sold my soul. Lucky for Ryan, he’s got the ever-practical Nik to work the sales for him. And, as it turns out, it’s lucky for me, too. At the bike show I had a fair bit of interest in my bikes. There were a couple of people whom I thought were seriously considering taking one home with them. But in the end, neither the road bike frame set, nor the stainless steel touring bike sold. On the last day of the show, Nik came to me with an offer. Look Mum No Hands is on a street in London with a lot of foot traffic, and they have a huge front window in which they are happy to display beautiful bicycles, the more interesting the better. If ever a bike could be called “interesting,” I believe the stainless touring bike might likely qualify. Nik talked with the owner of her shop, who agreed to put this bike on display. So, if you find yourself in London, and want to visit a very cool bike shop that happens to be attached to a cafe that serves delicious food, go to Look Mum No Hands. 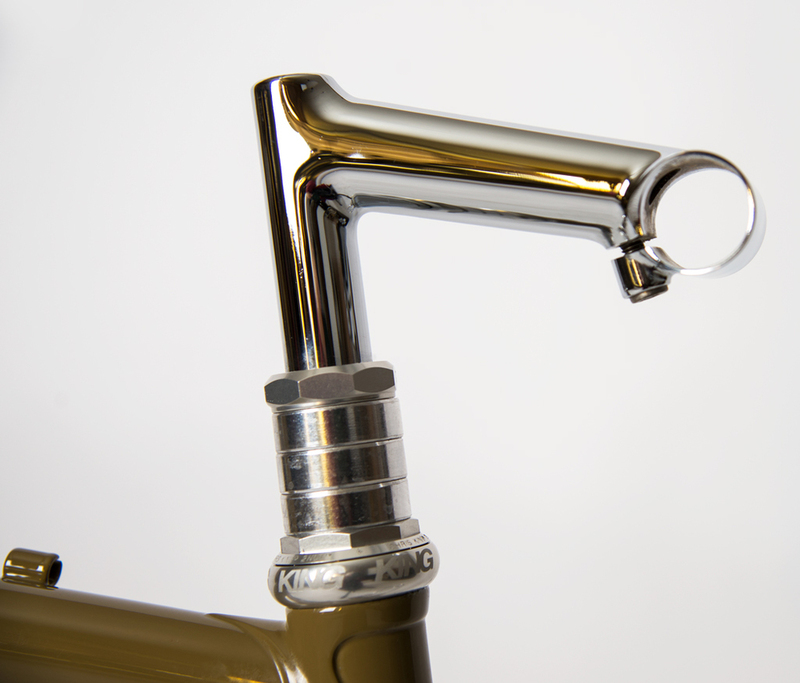 The stainless steel touring bike will be in the front window, and yes, it is for sale. I’ll be posting a detailed description of the bike, with it’s dimensions and features, in the near future. 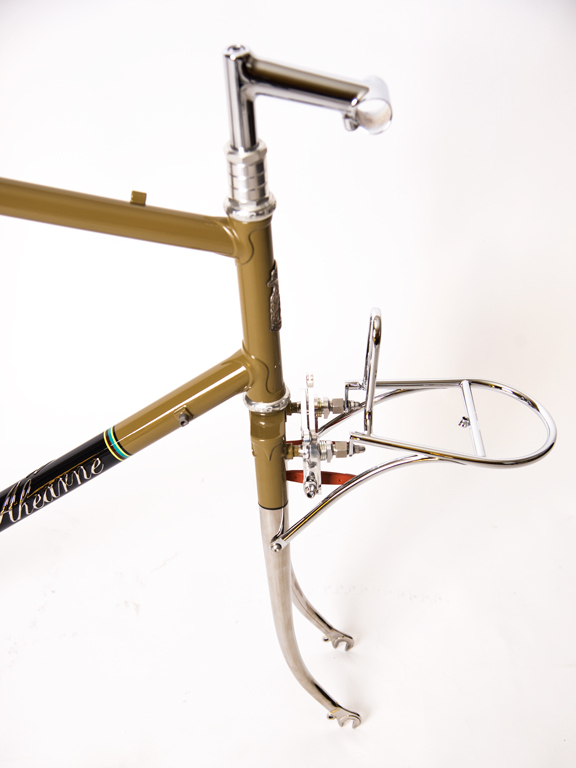 Polished stainless seat stays, chain stays and fork legs give this frame a classic appearance. Stainless steel brazed on down tube logo. The logo was polished and masked from paint, so that what you see is bare steel. The bike was built to use Paul "Racer Medium" brakes. With stainless steel seat stay caps. Chromoly stem, polished and chromed. 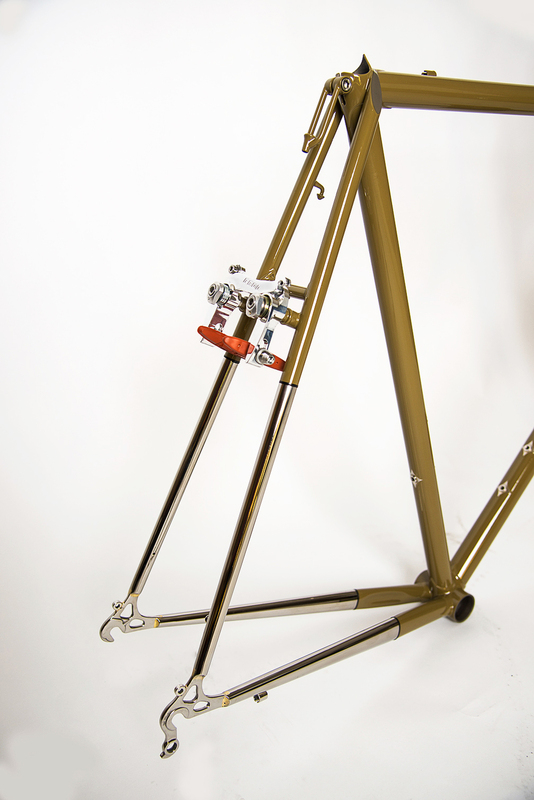 The road bike frame set that I showed at the Bespoke Show is also for sale. I brought this one back with me to the states. It’s available as a frame set (with rack, stem, brakes, pump and fenders), or we can help set it up as a complete bike, if that’s what you’d like. Details about this bike will also be posted on the website soon. This is the end of the first part of my trip. Next stop: Berlin.